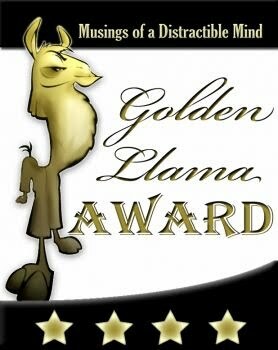 other things amanzi: at last, a golden llama! at last, a golden llama! i have just been awarded the prestigious golden llama award by the illustrious doctor rob over at musings of a distractible mind. he awarded it in a nice little limerick. i'm highly impressed with this most coveted of blog awards, but i feel a bit guilty (not guilty enough not to display the award of course). you see the reason i ended up in las vegas for the blogworld expo was entirely due to the efforts of doctor val over at better health. so, as part of my acceptance speech, let me acknowledge dr val as the catalyst that flew me over the ocean to the very strange land of las vegas. It does not matter. The poem would have won it, as would bringing your fine fiancee with you. But it was just such a delight to meet you in person that there is no way I couldn't award it. Besides, Val didn't get jet lag; you did. This work is suitable for comiplation and editing into a book. Perhaps even for the U.S. market. There actually are more than a few books that have been created out of freely available text. In in any case, for the U.S. market, there are other popular medical compilations, which doubtless you know of. Gawande's previously published items also are converted into book form, and your could be as well. Gawande's material is just as "free" as yours. I invite you to edit and convert your text into book form.